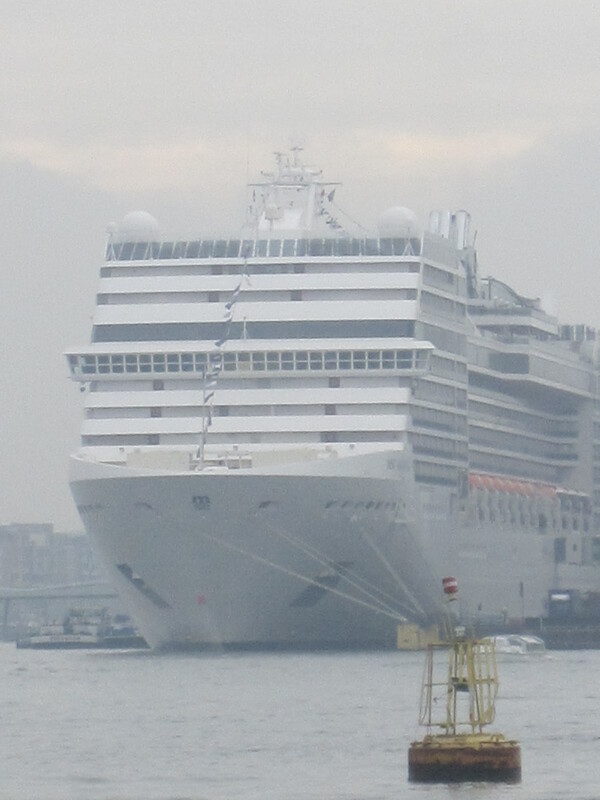 I joined MSC Cruises MSC Magnifica yesterday morning and so far I am very impressed. Check-in was swift and I was shown personally to my cabin, I really liked this touch! I walked through the door and was greeted with a rather nice balcony cabin and queen sized bed. Yes I have all of this space to myself and it feels good! After a brief exploration of my cabin I made my way out to start exploring the ship. Every inch of this vessel really is beautiful! Even the elevators have character! She also has the same sweet floral smell that I encountered on MSC Lirica last year (as does the liquid soap in the cabin bathroom). I can’t describe it but it’s not the usual cruise ship smell. Anyone who has cruised before will know what I mean by the ‘cruise ship smell’ but this ship instead wears her perfume! Over the last few days I have struggled to fit in a nice sit down meal so finally when lunchtime came I knew I had the chance to enjoy the buffet area and relax. I walked in and it just didn’t end! Everywhere you went there was food and it all looked delicious! I have been on ships larger than what MSC Magnifica is yet the buffet area is not even half the size of the one on here! You name it they had it and the selection of fresh bread was wonderful. It was so hard though to decide what to have so I opted for a cheese wrap that contained some kind of meat, no idea what it was (this was me being brave) but it was delicious! I also tried the stir fried rice with shrimp and chicken which too was very tasty. All I can say is for food lovers this is the place to come! It’s far from typical buffet food and the presentation is superb! After we sailed away from the port of Amsterdam I went exploring again! I found a HUGE casino. 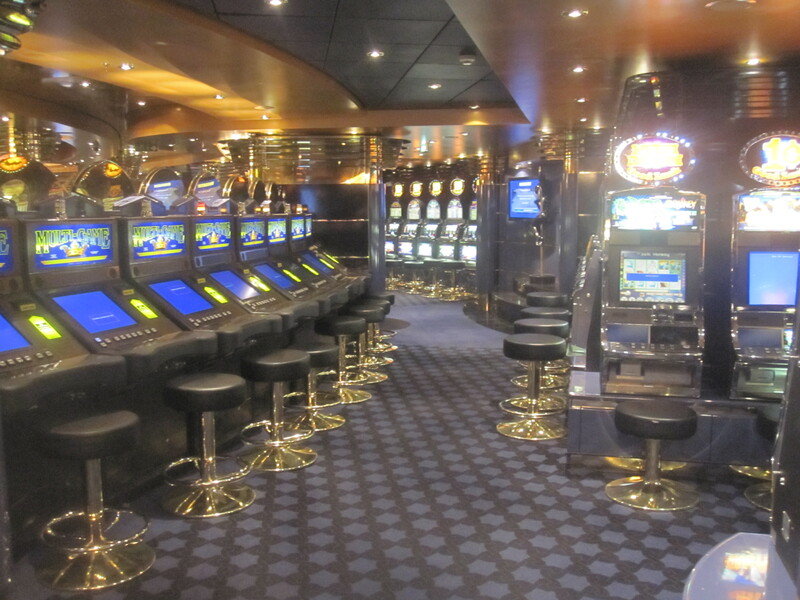 This my friends is what a casino on a ship should be like! I stumbled across the Sports Bar with ESPN showing on numerous flat screen TV’s and in the corner there sat a large billiards table. They also have a bobsleigh in the Sports Bar, full size! Along with sporting memorabilia and images. It’s a nice space and a great place for the women to leave the men when in need of some on board retail therapy! I walked past the Oriental Plaza restaurant which is a speciality dining option. The menu was quite varied and contained a lot of Sushi type dishes. It looked very nice but I don’t do raw fish so I’ll leave that taste test in the mouth of someone else. I also came across the Cigar Lounge, the two lane bowling alley and then right at the aft on deck 13 there was a very nice seating area where people were enjoying the sail away and lunch. Coming back to the centrum of the ship on deck 13 it felt like the majority of passengers were here! The weather as we left was actually very pleasant and surprisingly, warm! The space was full of people enjoying drinks, laughing, chatting and just enjoying being in that holiday spirit. In the evening I sat out on the open deck and enjoyed a drink and the atmosphere. The majority of those on board, I think, are German and Dutch. I have come across only two other British passengers. Not that it matters as everyone has been very friendly and will switch to English when you smile and say you don’t understand them. I even met a Gentleman and his mother whilst I was walking to the ship whom I then bumped in too in the terminal and have since enjoyed lunch with on board! This proves my point about cruising and how friendly the majority of passengers are and this was before I even got on the ship! 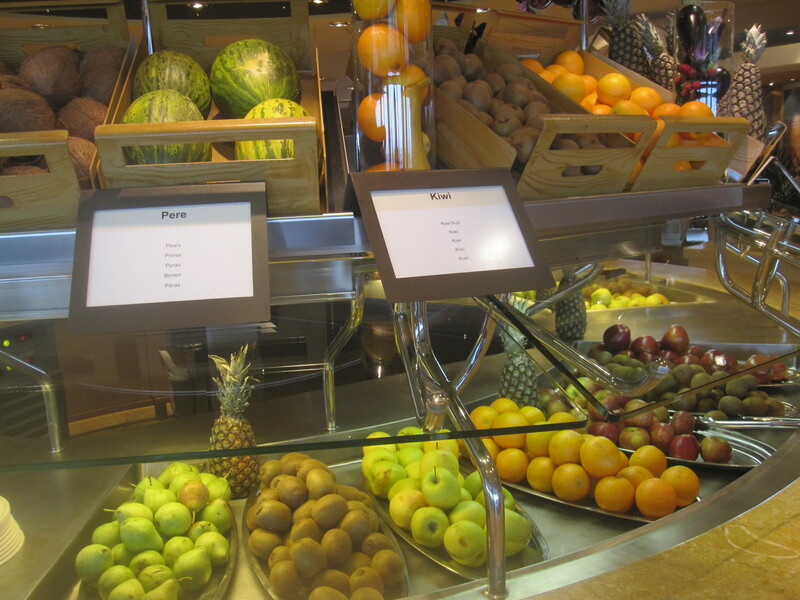 My first impressions of MSC Magnifica (if you have not already gathered) are very positive indeed! She truly is beautiful. Everything is clean, tidy and very well cared for. The facilities on board are above and beyond what I imagined them to be and I am certainly enjoying my taste of Italian style cruising! Breakfast this morning was the same scenario on simply what to have! There were boiled eggs, fried eggs, scrambled eggs, bacon, mushrooms, fruit, cereal, waffles and that was only half of what I actually looked at! I leave the ship today and head into Hamburg, we are docked until 21.30 so lots of time to explore and for those who are hoping to head into Berlin, lots of time to get there and back. I will add a full photo album of the ship’s facilities at the end of the cruise! And don’t forget to follow my journey via the official MSC Cruises Facebook page and my own CruiseMiss page.